Let’s shine a spotlight on some of the ethical companies used in my work! I love what they’re doing, and I believe that it’s important to leave the world a little better than we found it. Unfortunately, as a whole, we haven’t been doing a great job looking after our environment, or our fellow humans. The environmental impact of the fashion industry cannot be understated, from waters polluted with dyes, to textiles piling up in landfills, from child and slave labor in the fashion supply chain, to women and children losing their lives and limbs in garment factories. If you ask me, cheap clothing is not worth having that kind of blood on my hands, and it has no place in my work. If I have to be the cause of someone losing limbs, or children slaving, I can do without a cheap top, a garment I might throw away once it wears down quickly anyway. If you want to be part of the solution, try these brands that are actively trying to solve some of these problems! I use Pact for my custom baby onesies, Everlane for t-shirts, and FabScrap for a variety of projects. PACT: We believe in crafting clothing differently: Sustainable materials, kindness towards humans and the softest clothing you’ll want on every layer. Toxic dyes, pesticides and bad attitudes have no place in your clothes. EVERLANE: We spend months finding the best factories around the world—the same ones that produce your favorite designer labels. We visit them often and build strong personal relationships with the owners. Each factory is given a compliance audit to evaluate factors like fair wages, reasonable hours, and environment. Our goal? A score of 90 or above for every factory. FABSCRAP: Each pound of waste from apparel production is associated with 2.06 pounds of CO2-E. When disposed in landfill, the dyes and chemicals in fabrics can leach into the soil, contaminating local water systems. FabScrap takes huge quantities of discontinued, excess or unwanted fabric from big fashion brands, and either recycles, resells, or donates them to artists, students, and companies who can use the fabric and make something beautiful and unique. When you purchase ethically made fashion, you are voting for the kind of world you want to live in. You're Killing It: Tips & Tricks! For the most part, this design uses the back stitch, which is great for smooth lines and text. Embroidery floss is compiled of six strands. In general, you can separate the strands out for thinner lines, or use the whole 6 for thick lines. 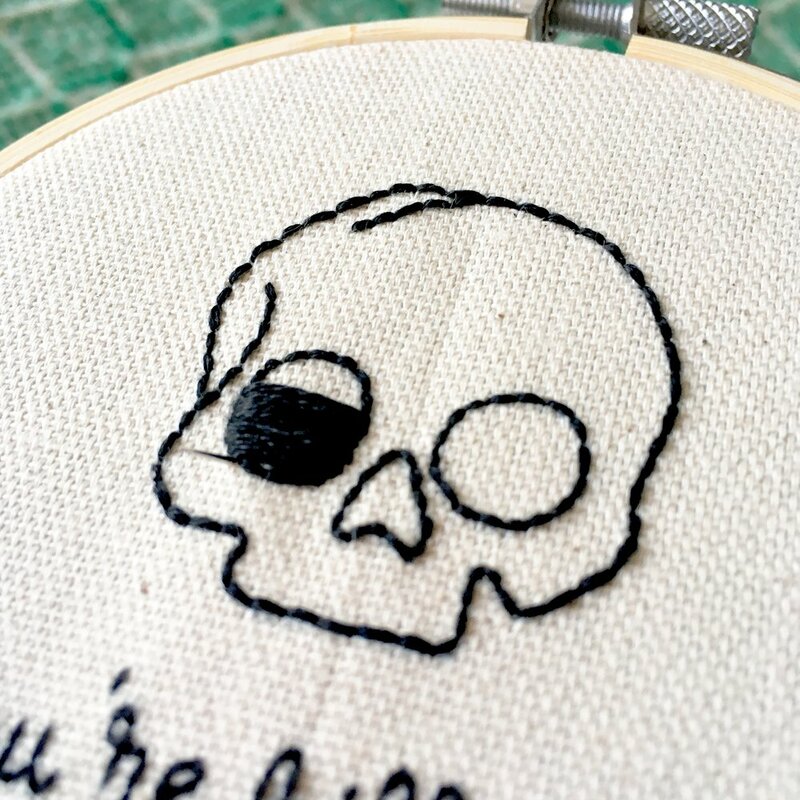 I recommend using 3 strands for the skull outlines, and only 2 strands for the text. I recommend beginning with the skull outline. 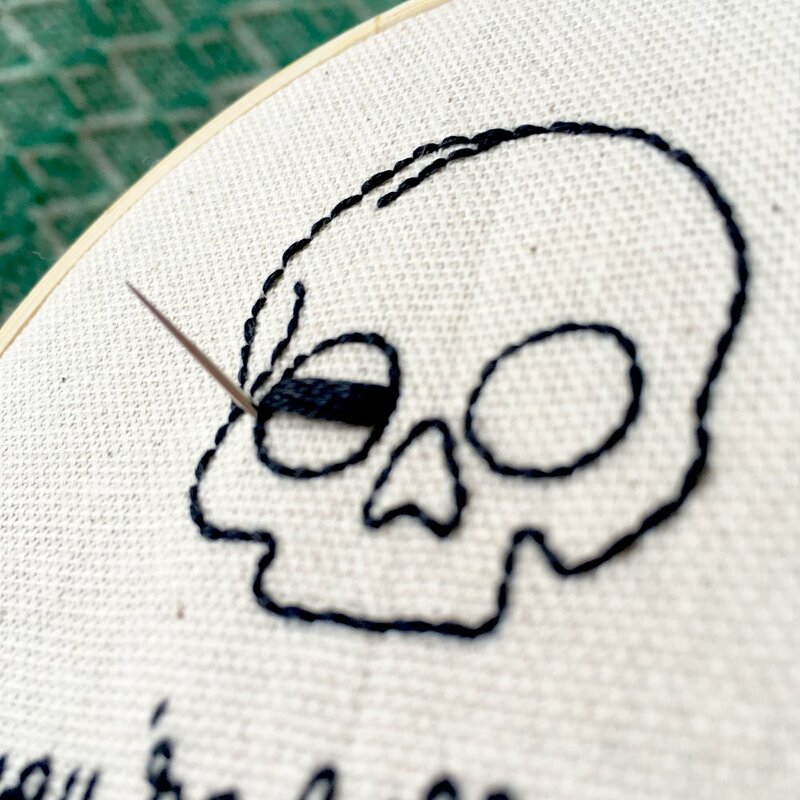 Make your way all the way around the skull using the back stitch (pictured below), outline the eyes and nose, using 3 strands. Back stitch the text using only 2 strands. This will help make the details more refined. After you’ve outlined the eyes and nose, you can leave them like this OR you can fill them using a satin stitch! This stitch creates blocks of solid color in your pattern, and the closely grouped stitches give your final product a shiny, satin-y finish. Using the full 6 strands will fill the space quickly. Satin stitches are just straight stitches made side by side, very close together, until they fill a space. Come up from the back of your fabric, getting the needle as close as possible to the outside of the outlines (that you did using a back stitch), and come back down directly across, again, on the outside of the outline. Keep going back and forth, so that your satin stitch looks nice and full - you can always go back and fill in bald spots. Once the shapes of the two eyes and the nose are filled in, secure the thread in the back by burying it in the stitches. Change direction a couple times to secure the thread (here I’ve buried the thread going up, then down behind the backs of the stitches). Just cut the thread at this point, and it should be secured! To finish your piece, you can add the black backing fabric behind the design. Finish with a ribbon! Congratulations! YOU ARE KILLING IT! Join me at Hudson Paperie in Hoboken for my Handkerchief Embroidery Workshop, Tuesday, March 26. Customize your own handkerchief to give as a gift or keep as a special treat for yourself. It’s great for Mother’s Day, or as a wedding memento. All supplies will be provided, and you’ll learn to embroider! Oh, and BYOB, my dears! Get your tickets now, class size is limited. Moonlit Pines: More Tips & Tricks! Embroidery floss is compiled of six strands. In general, you can separate the strands out for thinner lines, or use the whole 6 for thick lines. For most of this design, you’ll use two strands from the six. For the stars, use only one strand. Once you’ve finished the triangle behind the trees using the basic back stitch, you can begin the pines. I recommend using one long stitch for the trunks, to make sure they look very straight. 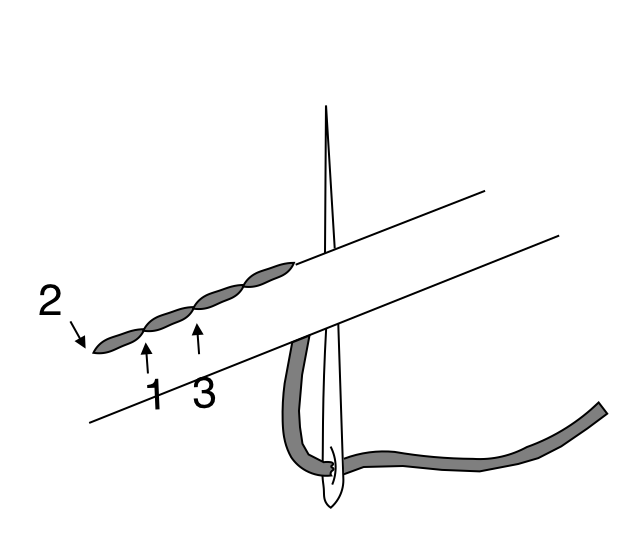 If you do the long stitch, you’ll need to secure the trunk down as you stitch the pine branches in the next step. To make the branches, I recommend beginning at the base of each tree trunk. Bring the needle up just next to the trunk and stitch over the trunk. For example, for a branch going left, come up on the right of the trunk, and stitch the branch over the trunk, going down to the left. Next, come up on the left side of the trunk, come over the trunk and down to the right for the next branch. This will begin to resemble a fishtail braid! There are guides for the branches printed on your fabric, but you can add as many branches to fill in the space as you’d like. In my example, I added enough branches to almost fill the space, leaving just enough space for the moonlight to shine through. The stars are just simple stitches going one over the other until you have a star! Since these stars are meant to look tiny and distant, I recommend using only one strand of embroidery floss for this step. When you’re completely finished stitching, and you’ve finished the back of the hoop however you’d like, you can hang your piece using the black ribbon. You can also tie it in a bow and place your piece proudly on a shelf. If you’re working on one of our DIY kits, here are some tips for starting and finishing your piece. First, embroidery floss is compiled of six strands. You can separate the strands out for thinner lines, or use the whole 6 for thick lines. For these designs, pull two strands from the six. Ideal floss length is up to you, but about arm’s length is usually good. Too short, and you have a lot of stopping and starting with new strands. Too long, and you’ll get tangles and knots while you’re working. Leave some excess floss near the head or eye of the needle, and at the very end of the length of the floss, tie a knot to act as an anchor for your first stitch. Ideal floss length is up to you, but about arm’s length is usually good. Too short, and you have a lot of stopping and starting with new strands. Too long, and you get tangles and knots while you’re working. The back stitch is great for smooth lines and text. (Step 1) To make your first stitch, come up from the back of the fabric, anywhere along the printed design. This will be your starting point. (Step 2) Pull the floss all the way through, until that little knot hits the fabric. Remember, it’s your anchor! (Step 3) Bring the needle back down, approximately 1/8” - 1/4” along the line of the printed design. You can actually make your stitches any length, but it looks nice when you keep your stitches consistent in length. You’ll sometimes need to make shorter stitches to get around a curve and keep it looking smooth. If you don’t like how a stitch looks, just un-stitch it and try again! (Step 5) Continue along the pattern line, but come up a space ahead (a stitch length ahead) and (Step 6) bring your needle back down into the same hole at the end of the previous stitch. Bringing your stitch back to the end of the last one makes one continuous line. You’ll keep going until you run the length of that floss, or until you finish the part of the design you’re stitching! When you get to the end of the floss or the design, or you want to switch colors, on the back side of the fabric, run the needle under the previous stitches. Here you can either just leave it secured under the stitches, or you can tie a knot. Trim the excess floss with scissors. These are just simple stitches going one over the other until you have a star! 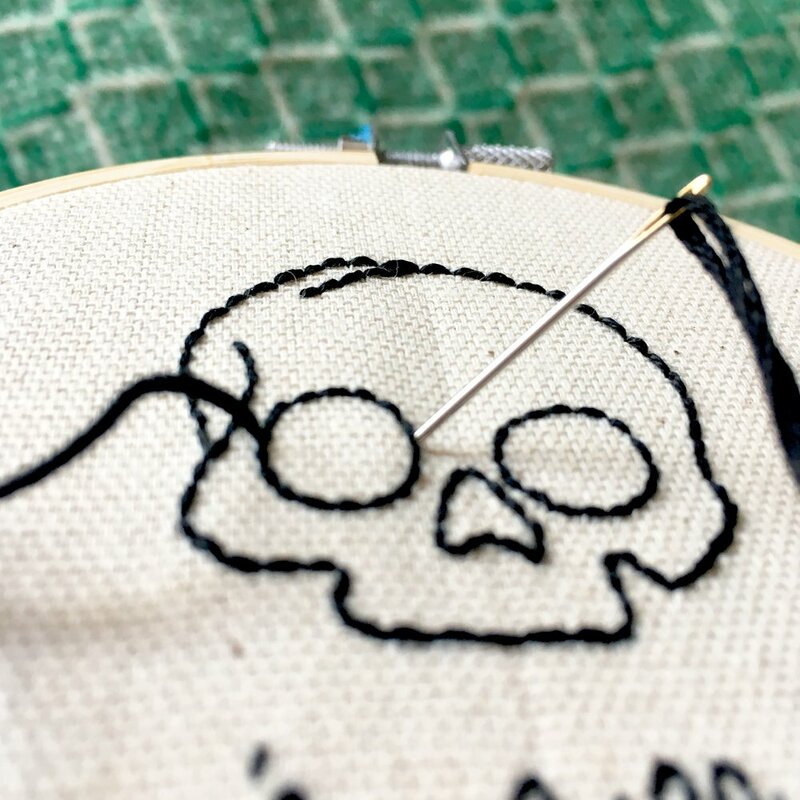 When you’ve finished stitching the entire design, and you’ve secured your floss by either threading it under previous stitches on the backside of the fabric, or you’ve tied knots, you can do a couple of things to finish the hoop. You can trim the excess fabric and call it a day! This leaves the back stitching exposed, but if you plan to hang your piece, no one will be able to see the back. You can gather and sew the excess fabric together, behind the piece, pulling it tight and securing it with a knot. 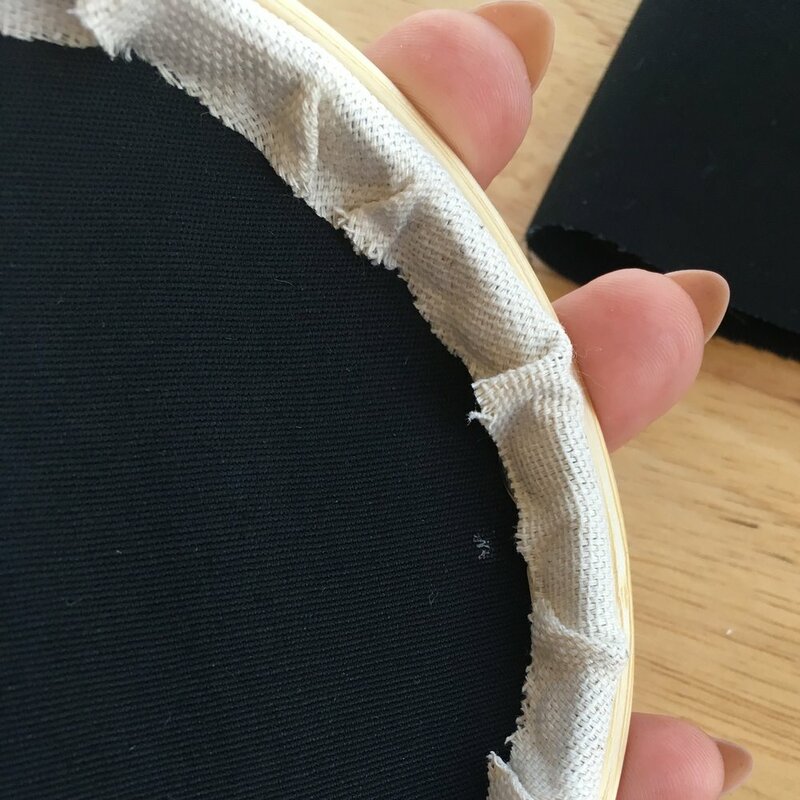 You can un-hoop your piece, place another piece of fabric behind it to cover the back, re-hoop it with the extra layer (make sure you center it again), and trim the excess (or leave the small buffer and hot glue the extra down inside the hoop). Some people use a fun printed fabric for the back as a cute, unexpected pop of color. You can sew or hot glue a piece of felt to the back, or even put card stock, cut to size, in the back. Hang your piece on a wall, place it on a bookshelf, or decorate your Christmas tree!